Did you know that tomatoes are the most popular vegetable grown in backyard gardens? There are about 7,500 different varieties, they take anywhere from 55 to 100 days to grow, and are an excellent source of vitamin A and C. They are fairly easy to grow and can become a family project for all to get involved in and enjoy. Tomatoes grow well in soil that drains well and receives at least 6 hours of sunlight daily, so be sure and pick out an area that will be best suited for them. After determining a good planting site and the variety of tomato you will grow, you will need to prepare your soil by removing any foreign materials such as branches, rocks and general trash. Make sure you have the best soil possible. If needed, visit your local nursery and ask them for a good quality planting soil to work into your garden soil such as our ferti•lome Organic Potting Mix. As you begin to transplant your tomatoes from container to garden, plant them on raised beds of dirt at least 6 inches high and make the holes 3 to 4 inches deep or slightly deeper than the containers they came in. Be sure to leave each plant at least 2 feet apart from each other so they have room to reach for the sunshine. If they are tall or leggy plants, you can lay them over into the soil, cover with more soil, and gently work the stalk with a 90 degree angle upwards. with better, juicier flavor and produce a bigger harvest with improved color and taste. Always follow label directions. for organic use. It's an all-natural option with a unique blend of microorganisms. Be sure to water the plants slowly and deeply to help develop a strong root system. Don’t let them wilt as this will affect the yield and quality of the plant, thus making the plants weak and susceptible to disease and insect problems. For best results, water in the morning when it’s cooler. For best quality, pick tomatoes when at full color. If you harvest or pick them before they become ripe, let them ripen at room temperature. You can refrigerate after they reach full color. To keep your plants healthy and producing fruit use ferti•lome Yield Booster to prevent Blossom End Rot. Blossom End Rot is cause by a calcium deficiency and can be recognized by dark grey/ black sunken areas on the blossom end (bottom) of tomatoes. 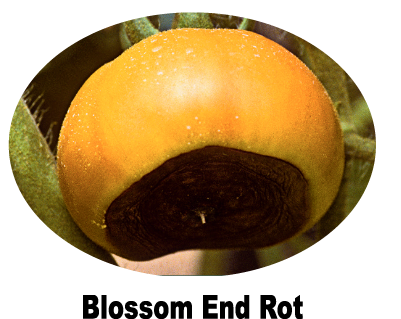 Blossom End Rot can be small or can cover almost half of the fruit and will decrease tomato yield. To increase your harvest, try ferti•lome Tomato & Pepper Set. 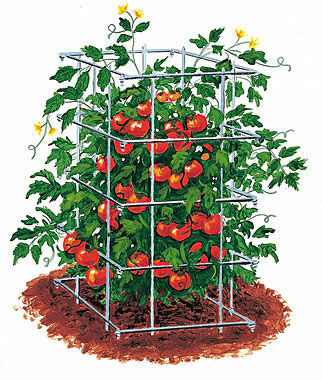 This ready-to-use product makes blossoms set fruit despite poor weather; nearly every blossom will produce larger, meatier tomatoes, ripening up to 3 weeks earlier. May also be used on cucumbers, beans, eggplant, melons, okra, peppers, strawberries and grapes. Chances are you’ll need an insecticide/ fungicide product to help control those pests that will come looking for a meal in your garden. 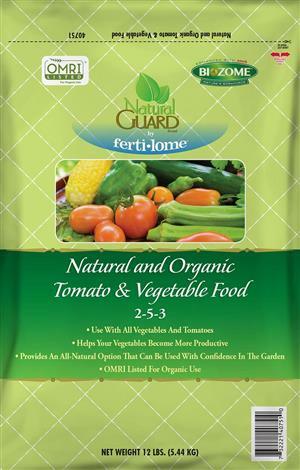 OMRI Listed for organic use ferti•lome Triple Action is a combination insecticide, fungicide and miticide contains neem oil to control common tomato pests (aphids, hornworms, whiteflies and many other listed pests) and various fungal diseases (leaf spot, anthracnose, blight and many other listed diseases). Whether it’s a leaf chewing or sucking insect, or a fungus problem, visit your local garden center and ask for the ferti•lome and Hi-Yield for Local Solutions For Local ProblemsTM.